Filling a gap in the literature, this up-to-date introduction to the field provides an overview of current experimental techniques, basic theoretical concepts, and sample fabrication methods. Following an introduction, this monograph deals with optically active quantum dots and their integration into electro-optical devices, before looking at the theory of quantum confined states and quantum dots interacting with the radiation field. 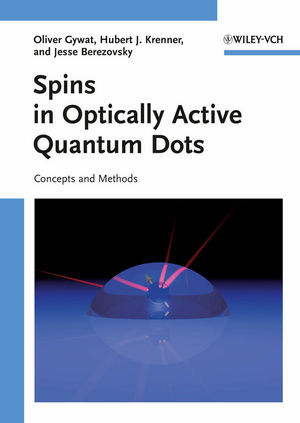 Final chapters cover spin-spin interaction in quantum dots as well as spin and charge states, showing how to use single spins for break-through quantum computation. A conclusion and outlook round off the volume. The result is a primer providing the essential basic knowledge necessary for young researchers entering the field, as well as semiconductor and theoretical physicists, PhD students in physics and material sciences, electrical engineers and materials scientists. Oliver Gywat received his PhD in the group of Daniel Loss at the University of Basel, where he has worked on the theory of spin and entanglement in optically active quantum dots, focusing on implementations of quantum information schemes. He then was a postdoctoral research scholar in the group of David Awschalom at the California Nanosystems Institute and the Center for Spintronics and Quantum Computation at the University of California at Santa Barbara. After completing his postdoctoral research in the theoretical and the experimental domain, he moved into finance and is currently working in the area of Investment Services and Products at Credit Suisse Private Banking in Zurich, maintaining a strong interest in nanotechnology and nanoscale sciences. Hubert Krenner received his PhD at the Walter Schottky Institute of the Technische Universität München in the groups of Gerhard Abstreiter and Jonathan Finley. After a two year stay as a Feodor Lynen Fellow of the Alexander von Humboldt Foundation in the group of Pierre Petroff at the University of California, Santa Barbara, he moved to the Universität Augsburg where he continues his work on control and manipulation of spin and charge excitations in optically active nanostructures. Jesse Berezovsky received his PhD at the University of California, Santa Barbara in the group of David Awschalom, and is currently a postdoctoral researcher at Harvard University. His research has focused on optically probing spin dynamics in nanocrystal quantum dots, as well as developing techniques for the optical readout and ultrafast manipulation of single spins in a quantum dot.